January 28 was a big day for YWAM Ships Newcastle and our supporters assembled at Honeysuckle. 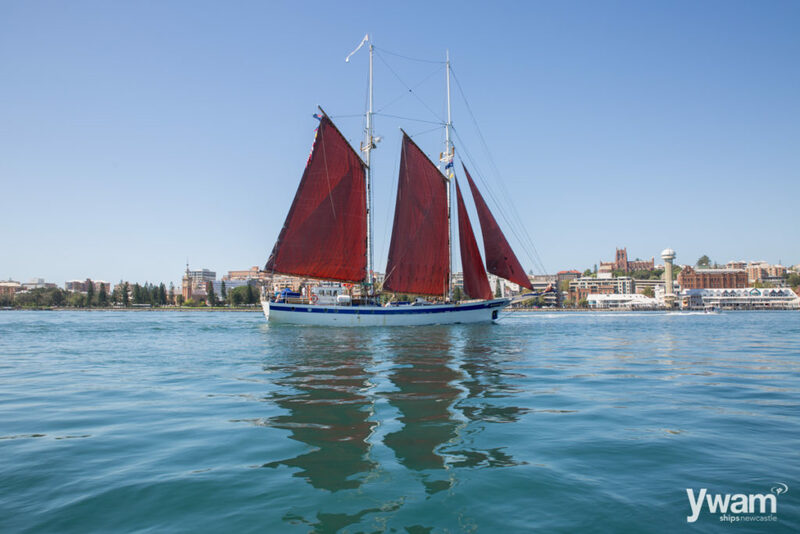 It marked the end of a 14,000 nautical mile journey from Germany, and the arrival of the s/v Ruach, the 37 metre sailing vessel, to its new home in the Port of Newcastle. What does this important work mean for the people of Newcastle? It means we can become part of an initiative that provides hope for mothers. In 2013, 27-year-old Makasi travelled for two weeks in her dugout to the YWAM Ship m/v Pacific Link in the hope of regaining her sight. After a short operation, her sight was restored and she could see her children for the first time. It also means hope for dental patients and up-skilling for local health personnel, working alongside their Australian counterparts. It means many families will see their children grow to healthy adulthood. They won’t fear losing their children to preventable diseases or that mothers will die unnecessarily during childbirth. Most of all, it means we are helping our neighbours, where and when they need it most. That’s got to be worth celebrating. The Newcastle-based Ruach will travel soon to PNG. On deployment, the Ruach becomes a floating hostel, complete with desalinators, catering and its own power supply. Volunteers on these outreaches who will provide land-based medical services, will visit some of the most beautiful, yet isolated and disadvantaged, people and places on the planet. The medical services offered by the Newcastle-based vessel will make a big difference to families and individuals in PNG. As such, an opportunity beckons for Newcastle’s citizens, corporates, medical and marine professionals to take ownership of the ship and an interest in the work it achieves in PNG. A civic reception hosted in February by Lord Mayor Nuatali Nelmes recognised our wonderful Swiss donors for their generosity in the outright gift of the Ruach for this work. The event was attended by special guests including Tim Crakanthorpe MP, and the YWAM Medical Ships Australian Patron Mike Reynolds. To extend awareness, we now offer public tours of the vessel, with information and opportunities to invest in the project. These begin on Saturday (May 13 and 14), and May 20 and 21. Times are 10-4pm Saturdays and 1-4 pm on Sundays. The vessel is berthed at Queens Wharf. You can help by bringing new toothbrushes and toothpaste, used prescription glasses, or even make a monetary donation during the tour. This is a way that Newcastle people can practically help some of our neediest and nearest neighbours in PNG. Mothers like Makasi — and many hundreds like her, whose lives literally change because of basic medical treatment. David Stephenson is the managing director of YWAM Ships Newcastle.